This post should be titled ‘How to make driving 200km (124 miles) of Australian highway more interesting’. Don’t worry, its not a list of obscure eye-spy objects (though we did go through a few of them on our 945km (1,522 mile) circular road trip through Victoria and New South Wales). No, I’m talking about the impressive Silo Art trail. A series of 5 huge mural style portraits by renowned Australian artists all painted onto giant grain silos, some of which date back to the 1930s. Together, these 5 silos create Australia’s largest outdoor gallery. The trail starts in Rupanyup, a small town just under an hours drive north of the Grampians National Park. It then snakes north through Victoria’s farmland for 200km up to the town of Patchewollock. Each individual piece of art aims to celebrate the people of the Wimmera Malle region and every artist involved spent time within the community prior to creating their mural.Standing in the shadow of these huge canvases looking up into the resilient faces of the locals portrayed is quite an incredible feeling. Though each piece is unique in style and content, every single face emanates a dignified bravery. 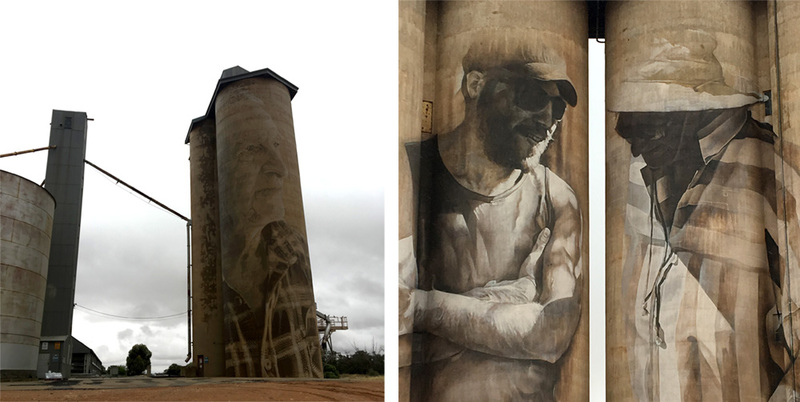 What started as a small community based project in Brim back in 2015 with Brisbane street artist Guido Van Helten inspired the larger Silo Art Trail project. I for one hope the project continues expanding throughout Victoria’s rural landscape. The trail takes around 2 hours to drive from start to finish and you can find all the information you need to plan a trip or work it into your itinerary here.